Everyone who enters is part of a highly respected international songwriting event and everyone receives a score/grade from the judges for each song plus certificates. (These scores/grades are officially recognised by the examiners at the MA International Music Academy and others). Taking part in this event can also lead to career success. For example Neil Fitzgerald (photo) was featured on national TV and signed to the world's biggest independent publishing company with his UKSC winning song, and the track has raised over £87,000 from sales. This year Katie Kittermaster was nominated by the UKSC as one of the UK representatives in The Commonwealth Song Contest and she then went on to win the whole international event, narrowly beating the Australian entry, which was also a UKSC Finalist. Leigh Haggerwood's Christmas Song entry was signed as the theme song for a major UK nationwide network TV show, has over 40 million (40,000,000) YouTube views and was playlisted in over 140,000 stores worldwide! UKSC winner Belle Humble has written for major artists, film and TV and has topped charts globally since winning the UKSC. Our Olympic Theme Winner was recorded and released by well known Juno Awards founder and producer Mel Shaw. UKSC winner Natale Chua was signed by Simon Cowell after her win and released a Platinum album. Other songwriters have received an ISA Award - The International Songwriting Awards - after recommendation and nomination from the UKSC judges. See more on the Success Stories page. The UKSC judges include Platinum and Gold, Grammy, Emmy, CMA and BRIT Award winning professionals such as producer Stuart Epps (Elton John, Robbie Williams, Oasis),Multi Platinum songwriter Shelly Peiken, Britney Spears' musical director and BRIT Award winner Simon Ellis, producer and arranger Richard Niles (Paul McCartney, Kylie Minogue, Take That, Mariah Carey), Sting's producer and Double Grammy and Emmy winner Kipper Eldridge, CMA Award winning country star Lucie Diamond, number one hit songwriter Mark Cawley, Oscar nominated TV and Film Composer Jamie Serafi, and UKSC winner and Platinum Album artist Natalie Chua (signed by Simon Cowell after her UKSC win). See where your song is in the judging panels as it happens. Announcements of Semi Finalist positions throughout the event. The sooner you enter the sooner you see results. ​See your entries and get progress reports in your Song Submissions Dashboard. Follow events and news on Facebook and Twitter. You can also interact with other songwriters at the UKSC Songwriting Community Group. You can also get updates from our blog by email - add your email address in the box below. All songwriters, composers and lyricists are welcome. It doesn't matter where you live or if you are a complete beginner or an experienced writer. Enter as many songs in as many categories as you wish. It is quick and easy to upload and enter an MP3 of your song - and Lyrics Only entries can be easily submitted online using a very simple form. If you have any questions they will be answered on the Help / Info Page. The contest was formed in association with The BRIT Trust (of BRIT Awards fame) with support from The BRIT School and The BRIT Studio in 2002 with the aim of discovering new talented songwriters and encouraging and supporting the craft of songwriting. In keeping with these original aims no one goes away empty handed. All entrants will be invited to be part of the exciting new World Concert Day annual event in October and prizes include co writing with top professionals, production, studio recording sessions, valuable songwriting software, personal mentoring and coaching and advice from top hit songwriters, international copyright registrations with SongCopyright.org, UKSC Certificates for every entrant and much more. EVERYONE WHO ENTERS receives song pitching opportunities and a package of useful songwriting courses from SongU and everyone is also awarded an official UKSC Certificate for each song with details of their song's position and achievement in the contest - it looks great framed on your living room or studio wall, as a prop in publicity photographs, or use it in your press kit or for when you apply for courses or jobs etc. Every writer is also told the judges score for each song entered which provides valuable information and feedback on how their song compares to all the others in the contest. Other prizes include memberships of the Guild of International Songwriters and Composers, media support, personal one-on-one coaching with a professional number one chart topping songwriter, CD artwork and much more... Click Here for full Prize details. Everyone has the chance to reach the Semi Finals and Finals in 20 song categories (Song Categories) and to go on to the Grand Finals. There are prizes and rewards at every level - see the ﻿Prizes Page﻿ for full details of the prizes. Your songs will be examined and given a score by industry professionals and you will also receive valuable song pitching opportunities and songwriting courses. You will be told the exact judge´s score awarded for each song and receive a UKSC Certificate for every song entered with details of your achievement and position. You will also receive a personal invitation to be part of World Concert Day 2019. The UKSC gives you a genuine chance to be noticed and discovered by the music industry in London and it is the only songwriting event that provides judges scores and certificates for each entry. No other contest works harder or provides so many opportunities to songwriters. "I was delighted to win The UK Songwriting Contest for the lyrics to 'Give Me Impossible Things'. It's a great opportunity for writers & musicians - and it has been really helpful for me - I can't recommend it enough!!" 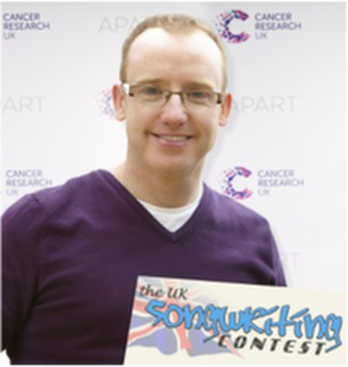 "The UK Songwriting Contest is a great tool to open doors for your music. I won semi-finalist and contacted media via the web - the rewards are "pinch me is this happening?" Thanks UKSC!" - Colleen Clark (USA) Colleen was interviewed and featured on Fox TV in the USA about her semi finalist position. This contest is open to songwriters from every country. Beginners and experienced writers are welcome and all are judged equally. This is an international contest with entries from every continent. Everyone has the same opportunity to showcase their work to top people in the music industry in London and have their work examined and judged in the UK and to appear in the Awards Show no matter where they live. Beginners have as much chance to be successful as experienced writers. See the Testimonials Page for genuine unsolicited comments from songwriters.